, we’ve published a new, dynamically updating KML file of commercial flights over the U.S. Turn on the layer to see the current location and altitude of thousands of flights, in near real-time. The KML file is created from data available on the Flightwise website, which they collect from the FAA every few minutes. 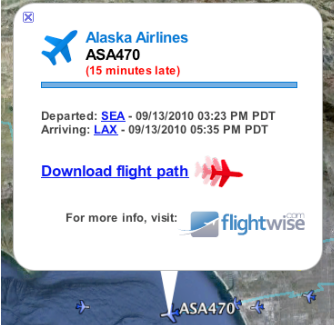 Hover over an airplane icon to see the airline, flight number, and up-to-date path. Clicking an icon yields an information-rich bubble showing more detailed flight information, including estimating arrival time. And finally, clicking on the “Download flight path” link in the balloon downloads a full KML tour of the flight so you can play back and rewind the flight up to its current position and see where it was at any point in time. * An homage to a classic film. Thanks to our friends at Flightwise.com, we’ve published a new, dynamically updating KML file of commercial flights over the U.S. Turn on the layer to see the current location and altitude of thousands of flights, in near real-time. The KML file is created from data available on the Flightwise website, which they collect from the FAA every few minutes.